No other Pakistani General is so often described as “controversial” as LtGen (Ret.) Hamid Gul, from 1987 to 1989 the Director-General of the Inter-Services Intelligence (ISI), the premier Pakistani secret service. During those last years of the Soviet occupation of Afghanistan he cooperated closely with the CIA and together they supported the Mujahideen including Osama bin Laden who has now been killed in the heartland of Pakistan where this most-wanted terrorist lived in comfort embedded in a secret infrastructure within Pakistan. Some say Hamid Gul is dangerous. This included US Secretary of State Rice. Pakistani President Asif Ali Zardari has described former ISI Chief Lt. Gen. Hamid Gul as "more of a political ideologue of terror rather than a physical supporter" in an interview with Newsweek in December 2008. Replying to a question whether US Secretary of State Condoleezza Rice had asked him to arrest Gen. Gul, he said, "Hamid Gul is an actor who is definitely not in our good books. Hamid Gul is somebody who was never appreciated by our government. She [Rice] did not go into specifics, if I may share that with you." (see "Zardari calls Hamid Gul political ideologue of terror rather than a physical supporter" The Nation. December 15, 2008). My impression is that he endorses a traditional way of thinking from the 1980's when he supported the Taliban movement in the national interest of Pakistan to control the Western neighbor Afghanistan while similarly avoiding his homeland being sandwiched by arch-enemy India. His own perception comes close to that of a true nationalist. I disagree with many things he says, but perceive him as a man worth listening to as he is not alone with his thinking in Pakistan. After meetings with U.S. generals David Petraeus and David Rodriguez (see U.S. General David Petraeus Commander ISAF about Progree in Afghanistan and Afghanistan: Why the UN via ISAF will win), several German ISAF generals and generals from the Afghan National Army (see Progress in Afghanistan: Two German Generals analyse and Afghanistan: Germans at the Front), it is most interesting to learn more about the thinking of this school of thought - if we like it or not. It is notably different from the ideas of former ISI Director and Pakistani Chief of Staff Gen. ret Ehsan ul Haq in his latest WSN interview some weeks ago (see Former Pakistani Chief of Staff and ISI Director Gen. Ehsan ul Haq on Afghanistan and Pakistan). The Taliban just announced a new spring offensive which ISAF has been expecting for several months. Hubertus Hoffmann: General, how strong are the Taliban now and how much support do they have in Afghanistan in light of the recently announced spring offensive? Hamid Gul: Taliban have grown from strength to strength over the years from the failure of operation Anaconda in 2003 to the fiasco of operation Mushtarik at Marja in Helmand province. They have become more confident and their ranks have swelled to around 50,000 fighting men. Now that they are sensing victory their morale is extremely high. Increasingly the Afghan population is turning to them as an alternative to Karzai's corrupt and incompetent administration. Hubertus Hoffmann: ISAF is on the offence with stronger Afghan Security Forces and have conceded territory from the insurgents. Is ISAF winning? Hamid Gul: This is an incorrect impression. The resistance does not offer pitched battles or positional defense. They prefer hit and run type of engagements. Hubertus Hoffmann: When should negotiations with the Taliban start? Now or later? Hamid Gul: Its already late. The matters will get worse if there is dithering by the US and NATO policy makers. Hubertus Hoffmann: Where? How long? Hamid Gul: Should be direct between high echelons of Taliban leadership and the US state department. Should take about a month to set the stage. Hubertus Hoffmann: Who must be involved? UN? Saudi Arabia? USA? Hubertus Hoffmann: Which role do you see for Pakistan? 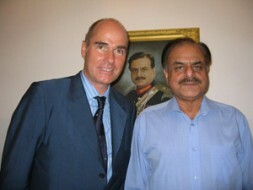 Hamid Gul: Facilitator and no more. Hubertus Hoffmann: Does Pakistan still need ‘strategic depth’ to defend against India? Hamid Gul: This is only a myth. A peaceful, stable and prosperous Afghanistan automatically provides strength and depth to Pakistan. However, larger than life presence of India in that country would neither be natural nor acceptable both to Pakistan and the future government of Afghanistan. Hubertus Hoffmann: Will the alliance of the Taliban and Pakistan be renewed? Hamid Gul: The future government of Afghanistan need not necessarily be exclusively Taliban. Pakistan will have to deal with whoever is in command in Kabul. Hubertus Hoffmann: What do the Taliban want? The same as in 2001 before 9/11 or a modern Afghanistan? Or a Turkish model? Mohammad Gul: The Afghan nation will evolve their own model and should be allowed to do so. The Taliban have reformed substantially as compared to their earlier conduct in governance. Hubertus Hoffmann: What about the women rights? Will they agree to treat all women like the Prophet did with his wives and daughters, very gentle and kind and not suppressive? Will women be able to work as governors, doctors, or officers? Hamid Gul: The question of women rights can easily be resolved in the light of the Islamic Shariah. It will take a while before they can be in equal positions due to the orthodox nature of that society. Yet, I see no difficulty for them to become doctors, teachers and working women in other vocations. Hubertus Hoffmann: And education, including girls? Hamid Gul: No problem at all. The Shariah does not discriminate. Hubertus Hoffmann: And free media? And one million internet-users? Hamid Gul: Taliban themselves are using the internet. Hubertus Hoffmann: Will the Taliban respect the Constitution of Afghanistan? Hamid Gul: Nobody in Afghanistan barring the vested interest has any love for this constitution. They will rally around Shariah which derives its inspiration from Quran and Sunnah. Hubertus Hoffmann: Isn’t the Taliban concept outdated like coming from the stone-age if you look what the Facebook children in Egypt or Tunisia are demanding? Hamid Gul: Mujahideen of Afghanistan are fighting for faith and freedom from foreign aggression which is not the case in Egypt and Tunisia and both these causes are rooted in the principles of Islam. They are as fresh and relevant today as they were 1,400 years ago. Only the new interfaces of contemporary times have to be explored and utilised. Hubertus Hoffmann: What kind of Sharia is it? Killing innocent citizens is illegal under Sharia law and jihad rules - why bomb attacks who kill civilians? Aren’t people who kill civilians in the name of Allah ‘unbelievers’ in the sense of the Koran, should be excluded from the Ummah and punished according to Sharia as they offend the Koran and the Prophet? Is this not blasphemy? Hamid Gul: That is why it is so important to invoke Shariah to get rid of the menace of terror practitioners who misuse the name of Islam. The ills of a Muslim society can be rectified by more and not less Islam. Hubertus Hoffmann: Will the Taliban agree to treat all enemies like the Prophet did when he conquered Mecca in 630 CE - killing nobody and respect the existing order? Hamid Gul: That depends on the nature of agreement between the US and Afghan resistance.